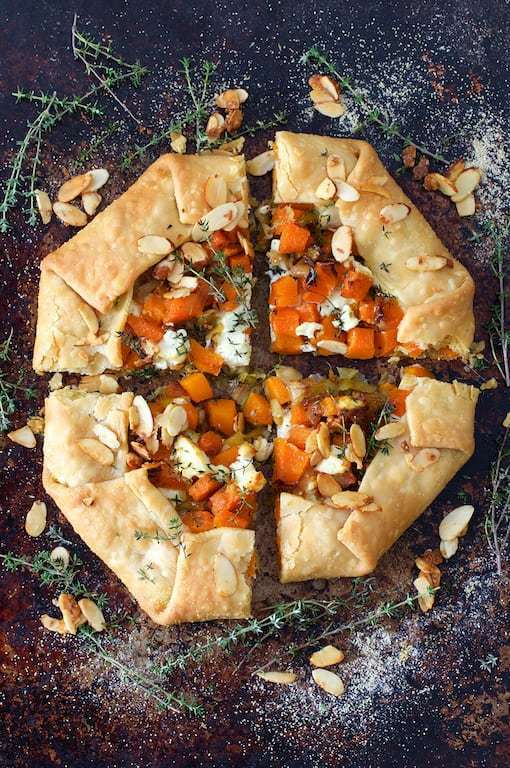 Butternut Squash, Leek and Goat Cheese Galette is simple, savory and elegant! Preheat oven to 375 degrees. Toss butternut squash cubes with 2 tablespoons olive oil, salt and black pepper and place on a baking sheet. Roast until easily pierced with a knife, approximately 25 minutes. Shake the pan or stir the cubes halfway through. Let cool and drain off any excess oil. Meanwhile, heat remaining olive oil and butter over medium-high heat in a skillet or saute pan. Add the leeks, reduce heat to medium-low and cook, stirring often until very soft, approximately 20 minutes. (Be careful they don't brown.) Stir in the garlic and thyme. Let cool and drain off any excess fat. Sprinkle cornmeal on a non-stick baking sheet. Unroll the pie crust and place on prepared baking sheet. Spread leek mixture over the crust to about 2 inches from the edge. Dab leek mixture with goat cheese. Top with butternut squash. Pull the edges of the crust over the mixture to create a freeform tart leaving the center open. Brush off any excess cornmeal. Brush pie crust with olive oil. Bake for 30-35 minutes or until crust is golden. Garnish with sliced almonds. Serve hot or warm.